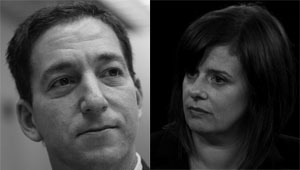 Attorney and journalist, Glenn Greenwald and Janine Gibson, editor-in-chief of Guardian/US, just completed a 90 minute Ask Me Anything on Reddit. The entire freewheeling transcript is here and an executive summary is provided below. Q: Are more groundbreaking leaks coming? A: There are definitely huge new stories to come: many more. I’ve said that from the start every time I was asked and I think people see by now that it’s true. In fact, as Janine said the other day, the documents and newsworthy revelations are so massive that no one news organization can possibly process them all. Q: With such a remote staff, how do you keep your work secret and safe from the very surveillance that you are exposing? A: We use highly advanced means of encryption. Remember, the only ones whose op sec has proven horrible and who has lost control of huge numbers of documents is the NSA and GCHQ. We have lost control of nothing. All of the documents we have remain secure. Q: The British claimed to have cracked the confiscated computer of your partner David Miranda. Is that true? A: They outright lied when they said he was carrying a password that allowed access to the documents. Indeed, on the same day they told that lie (to a gullible media that mindlessly repeated it as fact, as usual), the filed a separate affidavit saying it was urgent for them to keep possession of what they took from David because what he was carrying was “heavily encrypted” and they were able to only “reconstruct” 75 documents. Obviously, if he had a password that enabled access to the documents, then they would have been able to access them. He did not, and thus they could not. A major reason why those in power always try to use surveillance is because surveillance = power. The more you know about someone, the more you can control and manipulate them in all sorts of ways. That is one reason a Surveillance State is so menacing to basic political liberties. Q: Have the documents proven that the government has broken the law? A: I think there already are things clearly showing the government broke the law, including (but not only) the Constitution, but there is much more to come on that score. In my view, the two most overlooked stories we’ve published are the one you reference (about the secret presidential directive signed by Obama to prepare for offensive cyber operations: essentially the militarization of the internet) and the document we recently published showing NSA gives unminimized communcations of US persons to Israel with very few binding safeguards. Q: What is the goal of the NSA? A: I think the public – not just in the US but worldwide – now has a basic idea of the objective of the NSA: to eliminate privacy worldwide, literally, by ensuring that every human electronic communication is subject to being collected, stored, analyzed and monitored by the NSA and its allies (UK, Canada, New Zealand, Australia).